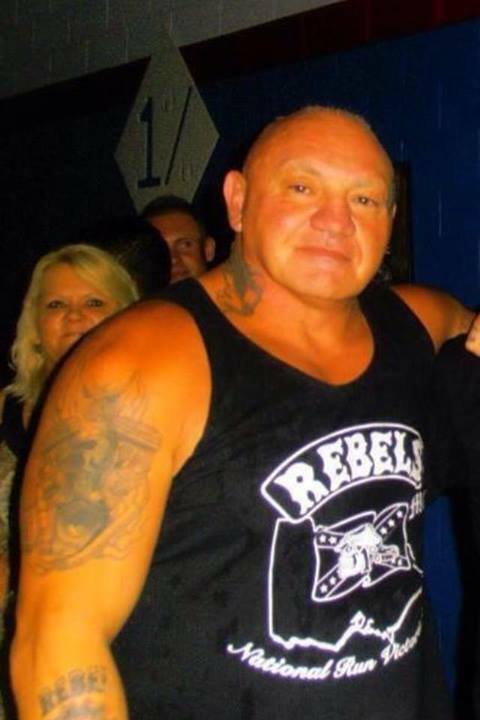 Stephen “The Brick” William McDowell died around 7pm on Sunday 13 October 2013 at the Ambarvale Hotel possibly due to a heart attack – having had heart problems for some time. McDowell was boarded out of the NSWPF Medically unfit in 1996 after Serving as a Police Officer for 17 years since 1979. He worked in the TRG ( Tactical Response Group ) and on HWP at Liverpool, G.D’s at Green Valley and Fairfield before being retired out of ‘the job’. McDowell, of Glen Alpine, was also the Sergeant at Arms and President of the Campbelltown chapter of the Rebels OMG. His nickname was ‘The Brick’ due to his strength and is famed for being able to bench press 180kg. He led a colourful life but, by all accounts, was a great bloke to work with during his Policing career and still had respect for his Policing mates over the years. Funeral details are not known at this stage. I am deeply saddened by the passing of Steve as he was a very loyal, caring, fair and courteous man. He was highly regarded and respected by those around him which in turn allowed him to become the success he was. He was an ethical, loving, loyal husband, father and son. May you Rest In Peace Steve as only the good die young. Big turnout for Steve’s funeral today.Pity a few more of his old work colleagues could’nt make the effort.He may have jumped the fence as Rebels President Alex Vella put it, but he was still the same old friendly Steve. A polite, respectful and humble guy who was always happy to catch up with old friends. A good bloke who will be fondly remembered.